The owners and operators of Bourbon Heat feel blessed to be able to serve the greater community whenever possible. Bourbon Heat has been involved with and supported various causes since opening and continues to do so. We have included passages from some of the letters of thanks below. We don’t support causes for praise, but because we believe in the work they are doing. These comments from this wide array of causes letting us know we helped make a difference are all the gratification we need. 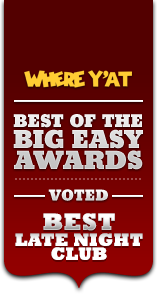 Just as New Orleans has many diverse qualities, so do the causes we support. We invite you to join us in supporting some of the causes we find worthy. 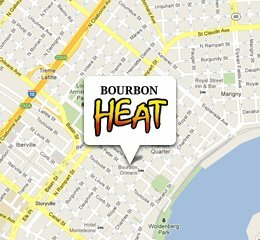 We want to thank Bourbon Heat for genrously hosting our kickoff party for the fourth year, as we return to New Orleans for the fifth year to continue to help in the rebuilding after Katrina. It was truly a great feeling to not only donate, but to actually help serve turkey and all the fixings for the Councilmember Nadine Ramsey / Zulu Thanksgiving luncheon for senior citizens! We would like to give a special thanks to our councilwoman Nadine Ramsey, her staff, & the Zulu Social Aid and Pleasure Club for allowing Bourbon Heat to be apart of such a special event. We will see you guys next year! I want to thank Angelo Farrell and the management and staff as well as all the great musicians, Kermit Ruffins, Rockin Doopsie, 5th Ward Weebie, James Andrews, Guitar Slim and Big Freedia, that came together to raise money for may family, after my three children and I were shot on our porch. Just three days after the shooting a full scale fundraiser was put on at Bourbon Heat that raised money for my family in our moment of need. We appreciate your generous partnership to provide support for our police officiers at this critical time. I would like to personally thank Bourbon Heat for hosting the kickoff party for the 11th Annual New Orleans Kidney walk. Your support continues to help the National Kidney Foundation of Louisiana achieve its mission. We truly appreciate your generoisty and look forward to your continued support. We cannot thank you enough hosting our AfterGlow Party at Bourbon Heat! Wow- and a great party it was! Your contribution made the weekend everything we hoped it would be! Thanks so much for the Role you played in our success. Thank you so much for your support and generosity during Heart Health month. We greatly appreciate your efforts to raise awareness and funds. I just wanted to say a BIG thank you for your generosity and planning for Don't Smoke, Prevent Stroke. For a first year event I think it was very successful. We had over a million media impressions for the Don't Smoke, Prevent Stroke initiative! This is more than any other community event for the American Heart Association. Thank you for your continuing commitment to LPCF through your sponsorship role at the Sixth Annual LPCF Mixed Doubles Tennis Classic, March 15 through March 18. This is the second year that Bourbon Heat has been there for LPCF and played a role in making the Tennis Classic a success. Thank you again for supporting music at French Quarter Festival - we could not pull off this Free community event without people like you. Thank you again for your commitment to Audubon Nature Institute.